Community Connections has partnered with NebraskaLand National Bank for their year-long campaign, Partnering for Positive Change, to help reduce substance abuse in Lincoln County. The goal for Community Connections is to raise a mile worth of quarters — or nearly $16,000 — in a year’s time. You can become a part of the campaign! Feed your change to the piggy banks at any NebraskaLand National Bank branch and 37 other local businesses, or donate online. You can even take part in our Partnering for Positive Change Challenge selfie contest through NebraskaLand National Bank for the chance to win prizes when you donate! The money raised will be used to reduce substance abuse in Lincoln County, specifically underage drinking, drunk driving, prescription drug use, and marijuana use. 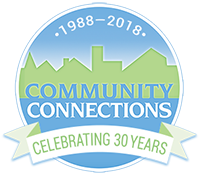 Community Connections main focus is to keep youth and families safe from the consequences of substance abuse through education, advocacy, and various programs.